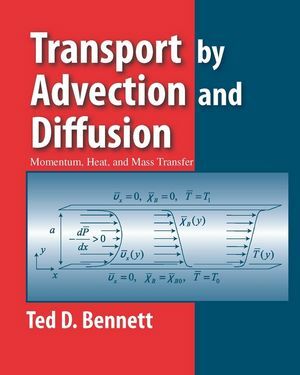 Bennett’s Transport by Advection and Diffusion provides a focused foundation for the principles of transport at the senior or graduate level, with illustrations from a wide range of topics. The text uses an integrated approach to teaching transport phenomena, but widens coverage to include topics such as transport in compressible flows and in open channel flows. Transport by Advection and Diffusion helps students develop the requisite math skills as well as the conceptual understanding needed to succeed in research and education. It presents analytical and numerical tools to aid problem solving in each topic area. The text is designed for senior or graduate level courses for chemical and mechanical engineering, environmental studies, earth science, materials science, and physics, but it will also appeal to practitioners. Ted Bennett is Associate Professor of Mechanical and Environmental Engineering at the University of California – Santa Barbara. He received his PhD from UC Berkeley in 1996. He has taught the transport phenomena course for the last 9 years, and in 2000 was awarded the Distinguished Teaching Award. Provides a focused foundation for the principles of transport at the senior or graduate level, with illustrations from a wide range of topics. Develops analytical and numerical tools to aid problem solving in every topic area of the text. Helps students develop the math skills necessary to combine with conceptual understanding needed to succeed in research and education. Uses integrated approach to teaching transport phenomena, but widens this to include topics such as transport in compressible flows and in open channel flows.